911 USA Attacked ! It's the End of the World as We Know it ! This story begins at the end. It's the End of the World as We Know it ! The first four links will take you to the previous works of this webmaster. This will take you to part one. Click here to go to part two. This link will take you to part three. This link will take you part four. This link will take you to an Anton Chekhov message board. Interested in kabbalah, click here ! This is a link to an e-mail recently sent to me that is a tribute to rescue workers, who sacrificed their lives. Let's talk about War of the Economy. This link will take you to the source of where I pirated this pic, you can find 19 other equally dramatic pics here. The Worst Place in the World to Work! You can hope to find some recent first hand accounts, regarding the World Trade Center attack, on this site. 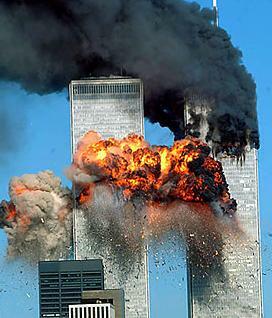 We all have reactions to this tragic event that occurred on 9/11/01. Some of what can be found here will be factual. Attempts will be made to back up the factual information with links with the source. Some of the items found here will be personal accounts from people I know who were actually at the scene, when the attack occurred. Other items will be accounts of individuals who were close to the scene of the attack during the ongoing clean up operations. Other items can best be described to as reactions to the event, or sentiments, feelings, or thoughts about this American Tragedy. The main idea of this site is to provide a space for those who are trying to obtain an in-depth understanding of the local, and global impact of this unwarranted attack on the free world. Additionally the general guiding principle of this site is to look for some of the various cause and effect relationships that could have lead to this tragedy. The same guiding principle will also be applied to discerning what array of future possible events will be triggered by this unforgettable incident. How has this event already changed the world, as we know it ? What are some of the possible future scenarios one can envision unfolding in the near future, which could clearly be attributed as a direct result of this attack on the U.S.
Could there be any legitimate cause, which would warrant such an offensive strike on innocent civilians going about their normal daily activities, in their place of employment ? How will this event shape our economic and political future ? What if anything can the United States, in collaboration with the Allies of the Free World, do that could possibly serve to offset the tragic loss of life, which was the direct result of attack 911-01 ? The important content here, is not so much what I have to say, but what you have to say. The link to the, 911 USA Attacked, message board is provided to allow individuals an opportunity to react to this tragic event. While mere words may be entirely inadequate to express our thoughts, feelings and reactions, it is still a good place to start.